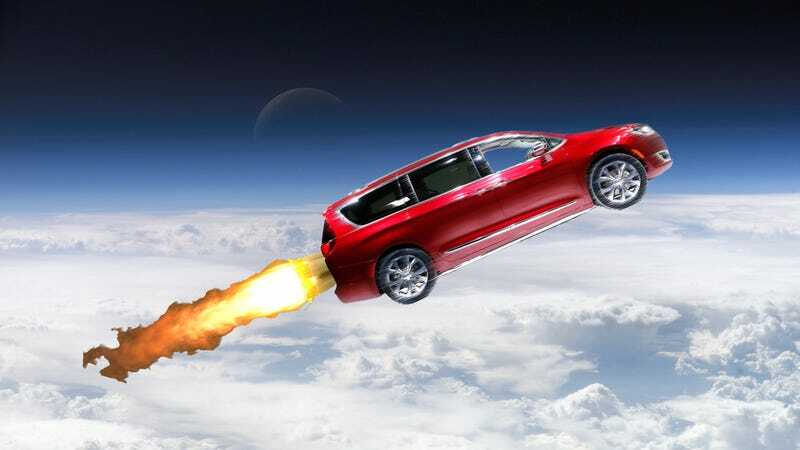 The news that Google’s next self-driving car will be a modified Chrysler Pacifica hybrid has quickly elevated “minivan” from the punchlines of dad jokes to a totally serious solution for our transportation troubles. It’s not surprising at all. Zipping a bunch of people and their stuff around a city safely is exactly what minivans were destined to do. The future of driving—ahem, riding—is the minivan. It’s very significant that Google’s teaming up with the company that invented the minivan in the 1980s. In the last 30 years, Chrysler has perfected the genre-bending vehicle that it originally designed for families. But the same reasons why minivans are great for toting kids to soccer practice are what make them the ideal self-driving vehicle. Minivans are easy to get in and out of for people of all ages and abilities, they have lots of cargo space, and come equipped with plenty of real estate for touchscreens and other navigational tools. They’re also already some of the safest cars on the road. Removing the human driver makes them even safer. Plenty of automakers have hit upon the idea that self-driving cars don’t need to be owned—why would you buy one, when it could come to you when you need one? Minivans are already much like mini-buses, which makes the minivan a just-right size for sharing rides. Google isn’t the first to hit upon this. Akka produced a compelling autonomous minivan concept in 2014 with a carpooling feature that foreshadowed tools like UberPool and LyftLine. Elon Musk hinted recently that Tesla was working on something that was “not exactly a bus” for ride-sharing solutions. In fact, many of the autonomous buses already on streets, like EasyMile’s six-seater WEPods, aren’t much larger than a minivan. Google, conveniently, has the technology chops to design the perfect routing and ridesharing app for its new van. Another advantage of the minivan is all that interior space. Of course minivans can function like van cabs that allow people to haul their belongings (this will be critical when people need to go shopping or on trips without their own car). But take out all the seats, and you’ve essentially got yourself a robot that can make deliveries. Autonomous tractor-trailers might be good for taking goods from city to city. But within those cities, there’s no reason to have big trucks on streets if goods could be routed more efficiently. Smaller, quieter vehicles could make dropoffs at all times of the day or night. No more idling trucks circling the blocks or parking on streets. Autonomous local transportation also might have the greatest impact when it comes to emissions reductions. No one will lament the loss of an exhilarating driving experience if the steering wheel disappears on the Chrysler Pacifica. Minvans are also ripe for future innovation because they’re kind of lame. They’re not the subject of rapturous affection from car fans who will be devastated if they can’t drive them anymore. We know Google has been building a case with the US government to eradicate the steering wheel from its prototypes—what’s called a Level 4 or “fully autonomous” vehicle, that can never be operated by humans—because it’s safer. No one will lament the loss of an exhilarating driving experience if the steering wheel disappears on the Chrysler Pacifica. By choosing the minivan, Google has made a vehicle choice that has the possibility to radically change the conversation about self-driving cars. A self-driving minivan could be a valuable tool for local transit authorities to shuttle a handful of people those last few miles to their destinations. It also provides a good mobility solution for someone who is blind or uses a wheelchair—a growing reality for our aging population. Because it’s more likely to be purchased for a family or as part of a fleet, a minivan removes a lot of the concerns that self-driving cars will increase car ownership or create more sprawl. Maybe most importantly, though, a fully autonomous minivan that’s designed to be more like public transportation moves the definition of a “car” farther away from this thing that’s used by one person at a time at great expense to the planet—and that’s exactly where we as a society need to go.